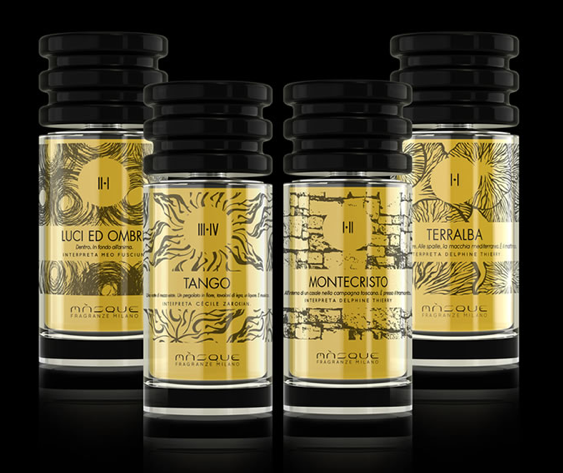 nero profumo: Masque Milano - An Interview With Alessandro Brun & Riccardo Tedeschi by Alfarom. 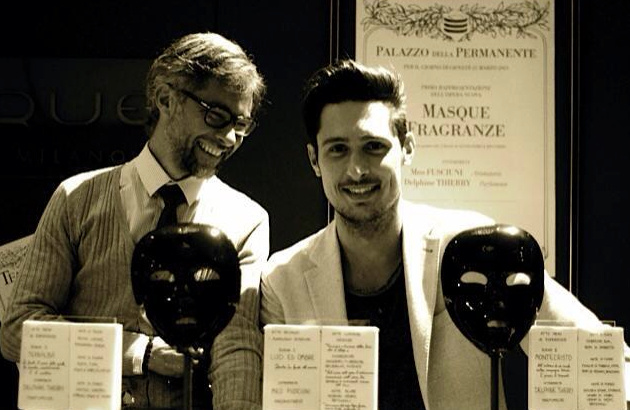 Masque Milano - An Interview With Alessandro Brun & Riccardo Tedeschi by Alfarom. Introduce Masque's concept. Who is your ideal customer? 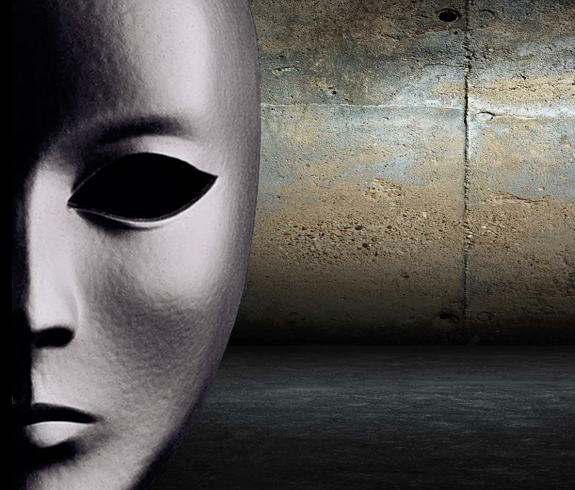 The main concept behind Masque Fragranze is one form of art rooted in Italian culture and tradition: "Opera". In an Opera there is a plot. Acts and Scenes, composing the story, interpreted by talented actors. With Masque Fragranze we aimed at creating one “scented Opera”, where every perfume represents one Scene, and every Scene is numbered. The whole collection is the Opera of Masque. It is quite hard to define a model customer: when we launched our line of artistic fragrances, we had the compelling desire to make our perfumes - and, hence, our art - known to the widest possible audience. Our ideal customers are interested in artistic perfumery -but not necessarily knowledgeable-, curios and keen to discover unexplored olfactory territories, and able to appreciate high quality raw materials and hand made details. These are customers that can appreciate the value of our products before even considering its price. How would you describe your brand's overall style? …do you have a signature? Talented noses and top quality raw materials first of all, but we also place great emphasis on the bottle design and the craftsmanship of the hand-made components, as well as the inspiration that guides us in the development of new olfactory scenes. The single element that is quintessentially Masque is the hand-made ceramic stopper. We wanted something unique and evocative, highlighting the importance of heritage of craftsmanship and human labour in our products. So we designed our signature "striped stopper", and we found out skilled artisans able to realize it, in the historic ceramic district of Deruta. Montecristo have made it to several *best of 2013* lists both from professionals and from the audience. Its evocative and striking power haven't surely passed unnoticed. Beside personal tastes, I think it's unquestionable it have been quite a brave and daring fragrance to include in your original range. What motivated you? In hindsight, Montecristo was a more than satisfactory launch and we are extremely happy of the buzz it created in the communities of perfume-lovers. Yet we had to pluck up our courage to launch such a bold fragrance when the brand was still young. When designing the line and launching the first fragrances, we wanted to make it clear that we were guided not by the desire to please the customer, but rather by the earnestness of defining what we are. Thus, each fragrance was to be unique and with a sharp and distinctive character. One of our favorite olfactory family is leather, hence we couldn't help but opening with a leathery fragrance. "Our" leather. We kept repeating to Delphine Thierry (the perfumer) that she was free to experiment in a way she was not allowed to when working for more "commercial" maisons. We really encouraged her to dare. Every new sample was more animalic, darker, more complex and plenty of different interesting facets. The final version was for us fully satisfactory. It was love at first …smell! After the surprising opening, when Montecristo shows its muscles, its power and character, the animalic and dark shades get softer, creating a comfortable - yet extremely original - atmosphere. We both studied Engineering, and have a passion for creating things - yet creating in an artistic way, breaking rules and avoiding clichés. We both love many forms of art, music above all - and we play guitar since boyhood. We love traveling, fine food, good wines, minimalistic design, elegant dresses and Italian joie de vivre. We are always eager to know and to experiment, restless and relentlessly looking for perfection. Riccardo's interest for fragrances turned into a real passion after a period spent in Australia, while studying small italian luxury companies Alessandro developed the ambition of creating his own luxury brand. Joining forces and revealing each other our plans, we soon started working towards a common goal… this is how we started. …and now Tango, which is rapidly becoming your potential blockbuster thus far. Talk us about it and about your collaboration with Cecile Zarokian. Every creation of Masque Fragranze follows its own path. We are not afraid of this. Because we really believe that each piece of art is unique – also in terms of creation process. The story of Tango is all of this: serendipity, our passions, a daring composition, different forms of art, … - mingling and sublimating in the precious jus. Tango belongs to the third Act of our scented opera, and Act III is the act of sentimental relationships. The first date. A romance. Falling in love. Being in love. Pledging everlasting engagement. The evolution of any sentimental relationship seems to follow this same path. As we do not follow clichés, we avoided to work on this story starting from scene I. We spent many nights trying to imagine how a few fragrances could epitomize the mostimportant of mankind ties. Drinking Ron Y Miel brought by Alessandro from Canary Island and listening to music, we found ourselves talking about sentimental relationships. Something starting getting clearer in our minds: we will open the act III in the most unconventional way: with a perfume dedicated to Scene 4, with a perfume about passion, yet a passion somehow linked to unfaithful liaison and betrayal. Tall. Dark hair. With Armenian origin, yet French as can be. Cherry-red lipstick on her lips. White working apron. Cécile welcomed us in her laboratory in Paris. 6 weird paintings on the walls: naked women in strange postures. Here, the two hands of a man behind the woman are stitching her lips; there, the woman’s torn body merges with the trunk of a large plant and her eyes are bleeding. Cécile perfumed each painting. She explains better – even though it was completely clear to us: she did an olfactory representation of the 6 paintings. We loved her works. We were amazed by the warm sensuality of her creations. You're working with very selected perfumers such as Delphine Thierry (Lubin, Cloon Keen Atelier, Majda Bekkali Sculptures Olfactives), Giuseppe Imprezzabile AKA Meo Fusciuni and Cecile Zarokian (Amouage, MDCI Parfums, Jovoy, Laboratorio Olfattivo, Suleko). How did you choose them and how the creative process works? We believe there is no an actor able to relate to every possible role with conviction; no musician able to play every single musical style with authenticity. Then, there could be no nose able to represent every single scene of the scented opera of Masque Fragranze. The fragrances of Masque are to be created with a soul, and the nose’s appointment is to give life to our scene. Hence, every scene will have “its” nose. The construction of every single scene entails the quest for the actor having, thanks to his or her repertoire of jokes and playing style, the ability to perform at his/her best in this very scene. There is no need to adapt a style … to learn new expressive languages … only to interpret in a personal way the essence of the play. Playwright and actor operate in perfect harmony. In every scene. Here at Masque, the journey for the creation of a new fragrance always starts from a personal meeting with a nose. Simple yet important deeds: visiting the artist’s lab, listening to the tale of his or her personal life and professional experiences, analysing the approach to perfumes concoction and smelling the best creations. And then describing our visionary project, offering a collaboration, appointing him or her to the creation of a newfragrance – that of the most appropriate scene. In our casting for the noses to interpret our scenes, we do not search for the ultimate technically talented skilled professional. It is empathy and passion that we seek. The ability to be deeply involved in the project, understand the brief, feel completely immersed in it, to the point that the creation of the perfume should came naturally at a certain point – without following any predetermined technical rule. Because we want to create perfumes with a soul. In a world dominated by commercial brands, driven by the dogmas of marketing, there are just a few fragrance houses in constant pursuit of excellence, and which proved always true to themselves in such an endeavour. • the apparently unsophisticated packaging clearly witnesses the maison’s emphasis on design and minimalistic luxury, while at the same time revealing the literary inspiration of the concept. Unlike Malle, which works with established master perfumers, already known and celebrated in the industry, we decided to scout for young and relatively unknown noses - rising stars of international artistic perfumery. Another peculiarity of our approach is that we do not leave the nose free to create according to the inspiration of the moment; rather, we ask the nose to “interpret” a specific “olfactory scene” within our Opera. Sometimes the indications are quite strict, as in the briefs we describe very complex “SmellScapes”, therefore giving quite binding directions and indicating explicitly a list of raw materials or specific smells to use. What about your packagings / presentations? Both the boxes and the bottles look simple and absolutely luxurious at the same time and they all have the perfumer's name embossed on a metal plate on the base of the sprayer. Who designed your packagings and why did you choose to give that much exposure to the perfumer? Certainly in perfumery the “protagonist” has to be the fragrance. At the same time, though, packaging plays a paramount role in communicating the brand’s identity and philosophy. We consider ourselves “luxury artisans”, and we want the packaging to be the best representation of the archetypal Italian luxury: unsophisticated, timeless, minimalistic, never screaming, betraying no excess nor overindulgence, yet gorgeously elegant. 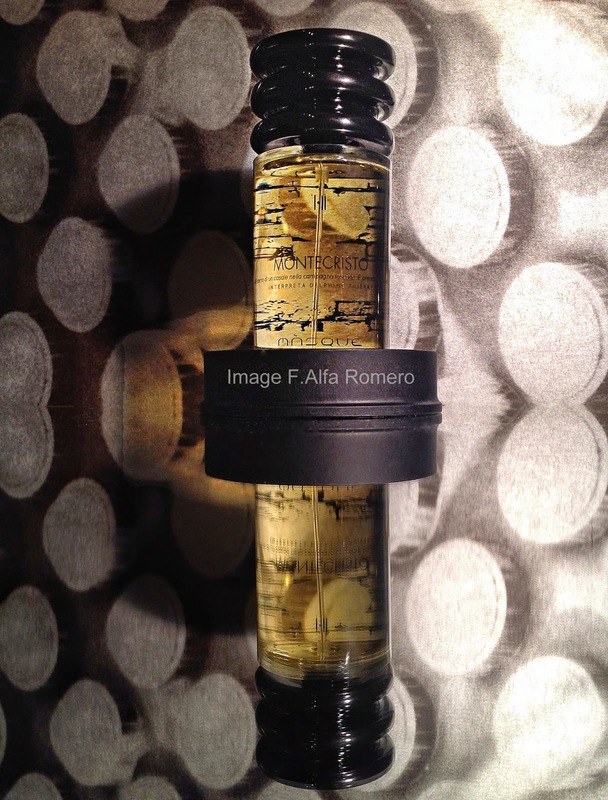 We – Alessandro and Riccardo – personally designed the whole packaging. We found out the “perfect” bottle (a simple cylinder), and carefully selected all the elements enriching and characterizing it: the pattern on the back, illustrating the spirit of the fragrance; the numbering of Acts and Scenes – roman numbers and a separating dot; the hand-aged pewter label showing the name of the nose creating the fragrance. And, of course, we designed our signature striped ceramic stopper. We then found out the artisan able to model the stopper. The patterns used to illustrate every fragrance are designed by young graduates of Politecnico di Milano. And by the way there are many company founders that are improvising as fragrance creators. This is simply not plausible, if the aim is that of creating excellent artistic fragrances. Alessandro and Riccardo are taking the role of playwrights and orchestra directors, but they do not jump on stage, a place reserved to the real artists – the noses! Will you ever offer your fragrances in different formats or different strength? Our fragrances are distributed in 100ml bottles. For the time being, we have no plans to introduce new formats. All the fragrances in our line are EdPs, but the concentrations in alcohol are carefully adjusted, fragrance per fragrance, in order to reach a perfect balance between the technical parameters -sillage and longevity- and the atmosphere described in the represented Scene. 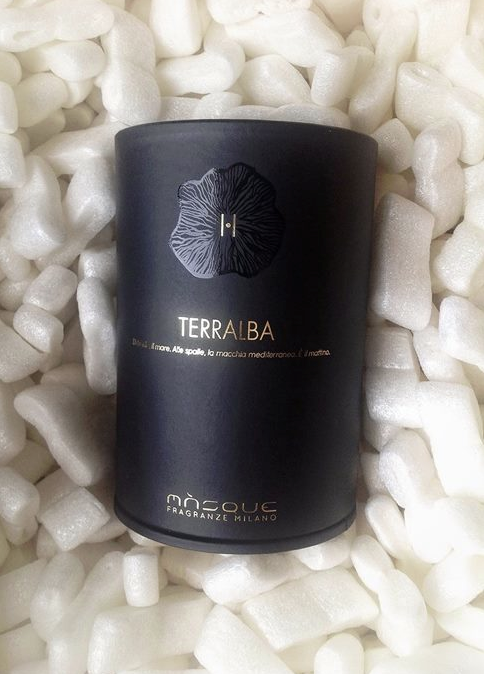 In Terralba, for instance, we wanted to convey a comfortable and relaxing feeling, thus, we could not increase too much the concentration, otherwise the woody/aromatic side would overcome the salty/fresh notes, and the fragrance would have become darker and would have lost its lightweightedness. 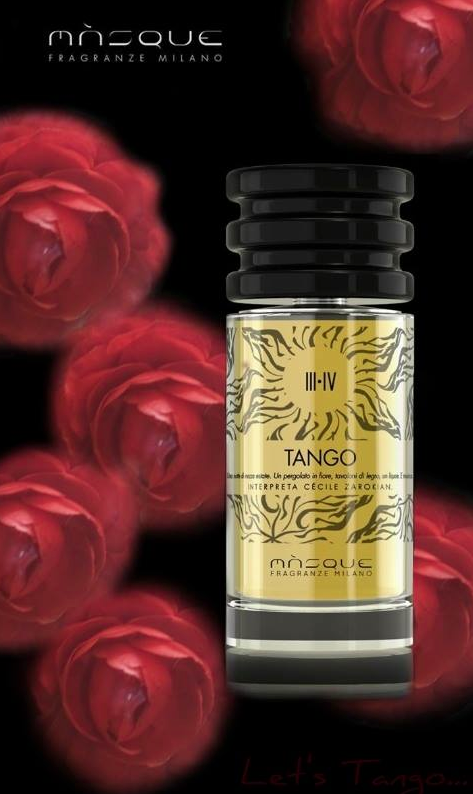 On the other hand, with Tango, we had to highly concentrate the perfume in order to boost the sensual and warm atmosphere of the Scene. What's next at Masque? Do you already have an idea on who is going to be your next collaboration? Our next fragrance will be called “Russian Tea”. It has been inspired by an episode happened during one of our trips to Russia. We were in Saint Petersburg, in an elegant café inside a large bookstore at the first floor of a sumptuous Art Noveau building. Out there, the snow-covered Nevsky Prospekt. By looking at the menu, we were enticed by a treat named “Russian Tea Ritual”. The maidens in white apron and bonnet brought us the teapot, black tea in leaves, fresh mint, raspberry preserve. Immediately, as water was poured in the cup, the infusion unleashed its most characteristic notes. Black tea, heavy and intense. A floral note, sharp and biting. And that unmistakably dry and smoky aftertaste given by the caravanserai campfires, meant to keep the precious tea cargo dry in the never-ending journey through Siberia. Some fresh mint leaves were used to give a pleasant fresh touch to the hot water. A teaspoon of raspberry preserve sweetened, without altering it, the bitter aftertaste of leather and birch. We were sipping it slowly, gazing out of the wide window, towards the beautiful cathedral of Our Lady of Kazan and beyond. The Russian Tea Ritual surprised us, and carried us to an unexpected journey in remote lands, full of mystery and fascination. We’ve been thinking awhile which nose would translate into a fragrance such experience, until we meet with Julien Rasquinet. We are glad to say that Julien was really “the actor” we were looking for. Belgian, born in London and grew up in Paris, Julien honed his talent in perfumery collaborating with Pierre Bourdon and Christine Nagel. We first met him in Milan, and when the creation process reached its culprit, to work “hands-on” on the fragrance, we spent two days in his ancient country mansion in Normandy, where Julien had the lab and used to live with his lovely wife Irina. Oh, and Irina is Russian – what a perfect adviser for a great “Russian Tea”. In early 2014, Julien was appointed to a leadership role in Middle East market for IFF... by accepting the new challenge, he moved to Dubai and even had to destroy his lab in the romantic Normandy setting. We feel so fortunate, as we have the honour to insert his very last creation as independent nose in our scented Opera. We are going to unveil Russian Tea at Pitti Fragranze, next September 2014.